A team of European astronomers has used ESO’s Very Large Telescope and a host of other telescopes to discover and study the most distant quasar found to date. This brilliant beacon, powered by a black hole with a mass two billion times that of the Sun, is by far the brightest object yet discovered in the early Universe. The results will appear in the 30 June 2011 issue of the journal Nature. “This quasar is a vital probe of the early Universe. It is a very rare object that will help us to understand how supermassive black holes grew a few hundred million years after the Big Bang,” says Stephen Warren, the study’s team leader. Quasars are very bright, distant galaxies that are believed to be powered by supermassive black holes at their centres. Their brilliance makes them powerful beacons that may help to probe the era when the first stars and galaxies were forming. The newly discovered quasar is so far away that its light probes the last part of the reionisation era . The next most-distant quasar is seen as it was 870 million years after the Big Bang (redshift 6.4). Similar objects further away cannot be found in visible-light surveys because their light, stretched by the expansion of the Universe, falls mostly in the infrared part of the spectrum by the time it gets to Earth. The European UKIRT Infrared Deep Sky Survey (UKIDSS) which uses the UK's dedicated infrared telescope  in Hawaii was designed to solve this problem. The team of astronomers hunted through millions of objects in the UKIDSS database to find those that could be the long-sought distant quasars, and eventually struck gold. 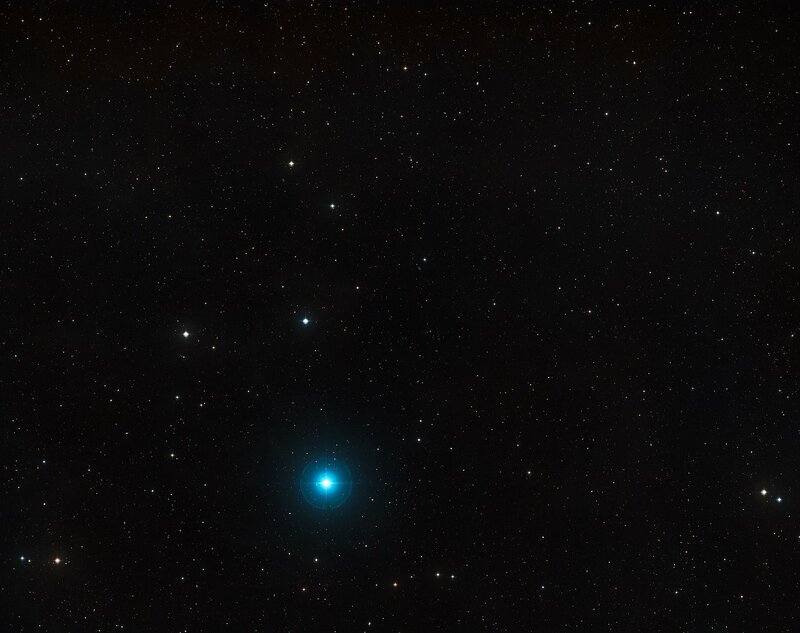 The distance to the quasar was determined from observations made with the FORS2 instrument on ESO’s Very Large Telescope (VLT) and instruments on the Gemini North Telescope . Because the object is comparatively bright it is possible to take a spectrum of it (which involves splitting the light from the object into its component colours). This technique allowed the astronomers to find out quite a lot about the quasar. These observations showed that the mass of the black hole at the centre of ULAS J1120+0641 is about two billion times that of the Sun. This very high mass is hard to explain so early on after the Big Bang. Current theories for the growth of supermassive black holes predict a slow build-up in mass as the compact object pulls in matter from its surroundings. About 300 000 years after the Big Bang, which occurred 13.7 billion years ago, the Universe had cooled down enough to allow electrons and protons to combine into neutral hydrogen (a gas without electric charge). This cool dark gas permeated the Universe until the first stars started forming about 100 to 150 million years later. Their intense ultraviolet radiation slowly split the hydrogen atoms back into protons and electrons, a process called reionisation, making the Universe more transparent to ultraviolet light. It is believe that this era occurred between about 150 million to 800 million years after the Big Bang. The object was found using data from the UKIDSS Large Area Survey, or ULAS. 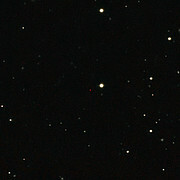 The numbers and prefix ‘J’ refer to the quasar’s position in the sky. Because light travels at a finite speed, astronomers look back in time as they look further away into the Universe. 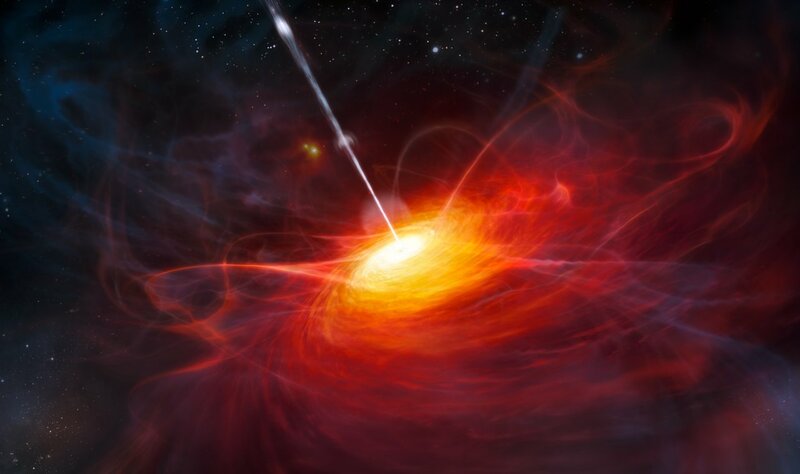 It took 12.9 billion years for the light from ULAS J1120+0641 to travel to telescopes on Earth so the quasar is seen as it was when the Universe was only 770 million years old. In those 12.9 billion years, the Universe expanded and the light from the object stretched as a result. The cosmological redshift, or simply redshift, is a measure of the total stretching the Universe underwent between the moment when the light was emitted and the time when it was received. UKIRT is the United Kingdom Infrared Telescope. It is owned by the UK’s Science and Technology Facilities Council and operated by the staff of the Joint Astronomy Centre in Hilo, Hawaii. 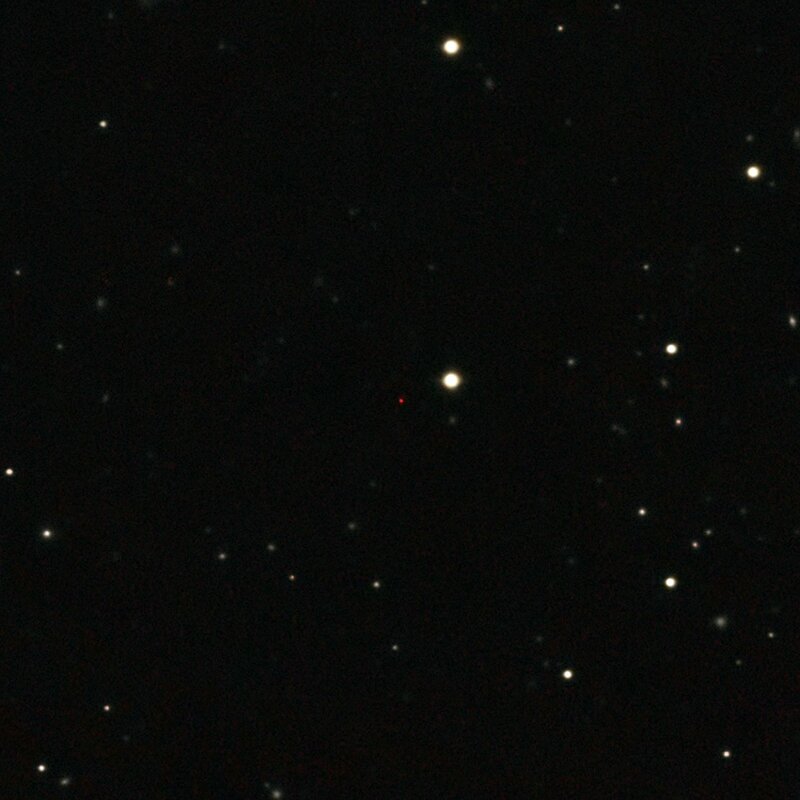 FORS2 is the VLT’s FOcal Reducer and low dispersion Spectrograph. Other instruments used to split up the light of the object were the Gemini Multi-Object Spectrograph (GMOS) and the Gemini Near-Infrared Spectrograph (GNIRS). The Liverpool Telescope, the Isaac Newton Telescope and the UK Infrared Telescope (UKIRT) were also used to confirm survey measurements. This research was presented in a paper to appear in the journal Nature on 30 June 2011. The team is composed of Daniel J. Mortlock (Imperial College London [Imperial], UK), Stephen J. Warren (Imperial), Bram P. Venemans (ESO, Garching, Germany), Mitesh Patel (Imperial), Paul C. Hewett (Institute of Astronomy [IoA], Cambridge, UK), Richard G. McMahon (IoA), Chris Simpson (Liverpool John Moores University, UK), Tom Theuns (Institute for Computational Cosmology, Durham, UK and University of Antwerp, Belgium), Eduardo A. Gonzáles-Solares (IoA), Andy Adamson (Joint Astronomy Centre, Hilo, USA), Simon Dye (Centre for Astronomy and Particle Theory, Nottingham, UK), Nigel C. Hambly (Institute for Astronomy, Edinburgh, UK), Paul Hirst (Gemini Observatory, Hilo, USA), Mike J. Irwin (IoA), Ernst Kuiper (Leiden Observatory, The Netherlands), Andy Lawrence (Institute for Astronomy, Edinburgh, UK), Huub J. A. Röttgering (Leiden Observatory, The Netherlands). ESO, the European Southern Observatory, is the foremost intergovernmental astronomy organisation in Europe and the world’s most productive astronomical observatory. It is supported by 15 countries: Austria, Belgium, Brazil, the Czech Republic, Denmark, France, Finland, Germany, Italy, the Netherlands, Portugal, Spain, Sweden, Switzerland and the United Kingdom. ESO carries out an ambitious programme focused on the design, construction and operation of powerful ground-based observing facilities enabling astronomers to make important scientific discoveries. ESO also plays a leading role in promoting and organising cooperation in astronomical research. ESO operates three unique world-class observing sites in Chile: La Silla, Paranal and Chajnantor. At Paranal, ESO operates the Very Large Telescope, the world’s most advanced visible-light astronomical observatory and two survey telescopes. VISTA works in the infrared and is the world’s largest survey telescope and the VLT Survey Telescope is the largest telescope designed to exclusively survey the skies in visible light. ESO is the European partner of a revolutionary astronomical telescope ALMA, the largest astronomical project in existence. ESO is currently planning a 40-metre-class European Extremely Large optical/near-infrared Telescope, the E-ELT, which will become “the world’s biggest eye on the sky”.